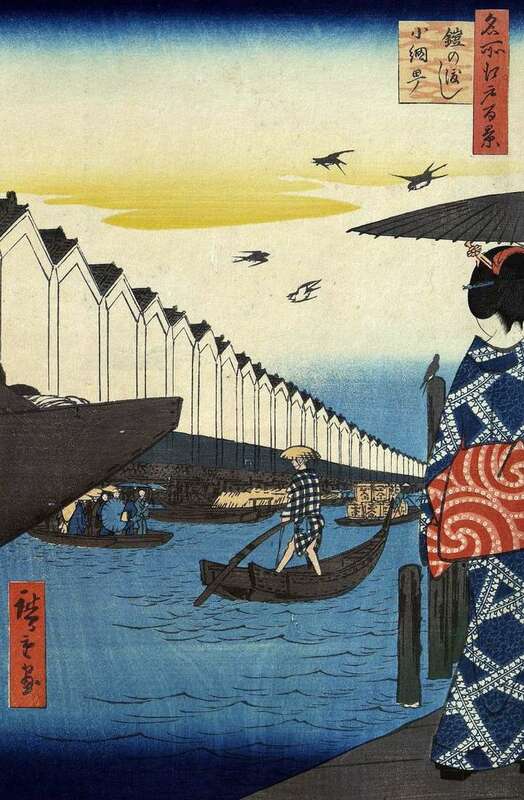 Hiroshige shows a view of the Nihonbasigawa River, which opens from the Kayabate quarter, which means “Miscant warehouses”. Here were shops of merchants who traded a miscant-reed, they were covered with roofs of houses. On the other side in the Qo’mite quarter, there were many warehouses in which a wide variety of goods were stored. At the quays of the Quamet Quarter are vessels waiting for loading. In the depth of the sheet is visible a boat loaded with boxes of tea. In the left part of the sheet is a ferry crossing the river filled with standing people. On the left, in the foreground is the nose of a large boat. The girl that the viewer sees from the back, apparently, is heading for the crossing. The name of the crossing is connected with the legend about Minamoto Yoshiye, the legendary warrior of the end of the Heian period, which tells about his military campaign against the banks of Osyu. Description and meaning of the painting Yeroi-no Watasi crossing to Komite by Utagawa Hiroshige.